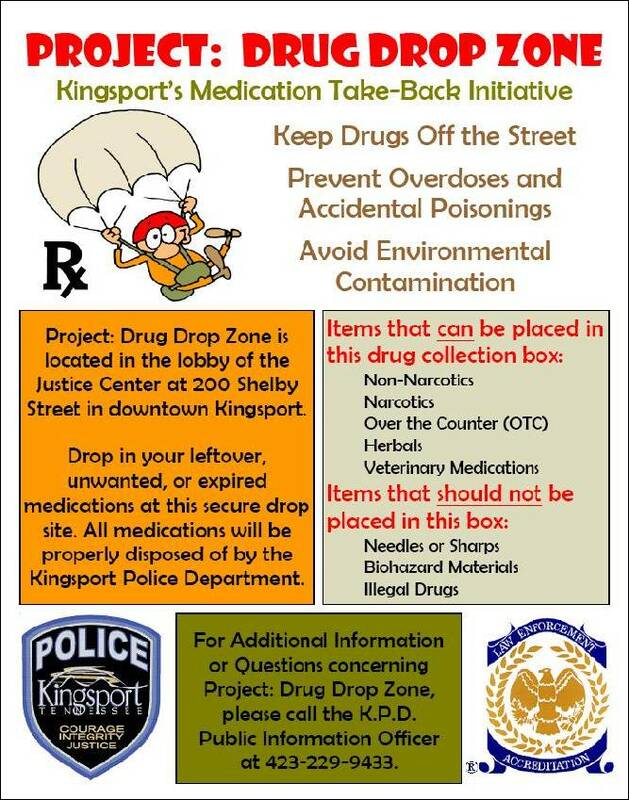 The collections from the Kingsport Police Department’s medication take-back initiative known as “Project: Drug Drop Zone” have recently exceeding the 2-ton mark! From day one, “Project: Drug Drop Zone” was a cooperative effort between the Kingsport Police Department and East Tennessee State University’s Bill Gatton College of Pharmacy. The project began on September 25, 2010 when K.P.D. held its first drug take-back event at the Rhoten Allstate Agency in Kingsport. In just four short hours, K.P.D. collected 179 pounds of leftover, unwanted, or expired medications. The success of this first event solidified the need for a more permanent and easily accessible collection site. Thanks to a grant from the National Association of Drug Diversion Investigators (NADDI), on January 27, 2012 a permanent drop box was installed in the lobby of the K.P.D. Justice Center, conveniently located at 200 Shelby Street in Downtown Kingsport. K.P.D.’s drug collection box is accessible 24 hours-a-day, 7 days-a-week, 365 days-a-year. To date, “Project: Drug Drop Zone” collections have exceeded 4,000 pounds. Any prescription medications, over the counter (OTC) medications, herbals, supplements, vitamins, and veterinary medications can be placed in the box. The department asks that no needles or sharps, biohazard materials, or illegal drugs be placed in the box. The United States Department of Justice and the Drug Enforcement Administration (DEA) have officially declared this coming Saturday, September 27, 2014 as “National Prescription Drug Take-Back Day.” Citizens are strongly encouraged to take an inventory of their medicine cabinets and bring their expired, unused, or unwanted medications to any of the above collection sites for proper disposal by local law enforcement. 1) MONITOR…where they are, how many you have, and who has access to them. 2) SECURE…hide or lock them safely in a cabinet, drawer, or box. 3) DISPOSE…properly any expired, unused, or unwanted medications. As a direct result of K.P.D.’s “Project: Drug Drop Zone” and similar programs across the region, East Tennessee State University has received grant funding of $2.2 Million from the National Institute on Drug Abuse (NIDA) to launch a five-year research program aimed at battling prescription drug abuse and misuse.